At the end of the previous session we decided to set a weekend task which entailed developing the logo concepts that were presented to the group on Friday. During the presentation process, members of the group who weren't presenting offered feedback and helped to outlined the strongest designs. Following the critique process, the weekend task challenged group members with continuing the logo development process, exclusively working on the most successful design as outlined by the group. These logo variations were outlined as the strongest variations. Prior to the task, I had focused my time on developing a system of logos that can be built up and arranged in different ways, the concept behind which aimed to encapsulate the brand values of growth and connectivity. During the criticism, members of the group were very positive about the idea however, due to the time frame in which the logo system was developed in the design was fairly messy. Therefore, I spent a few hours over the weekend redesigning the icons and developing the concept to a higher standard. The design process was started by redesigning the set of icons developed for the previous criticism. The new set of icons were created using a small 6x6 grid to ensure the set of illustrations are cohesive and can potentially be overlaid and/or overlapped. Icons were created with thick bold lines to ensure that they are striking and will stand out when used at a range of sizes. The reason that there are two variations of the same icon is because the design on the left is the lined version and the design on the right has been expanded and refined. 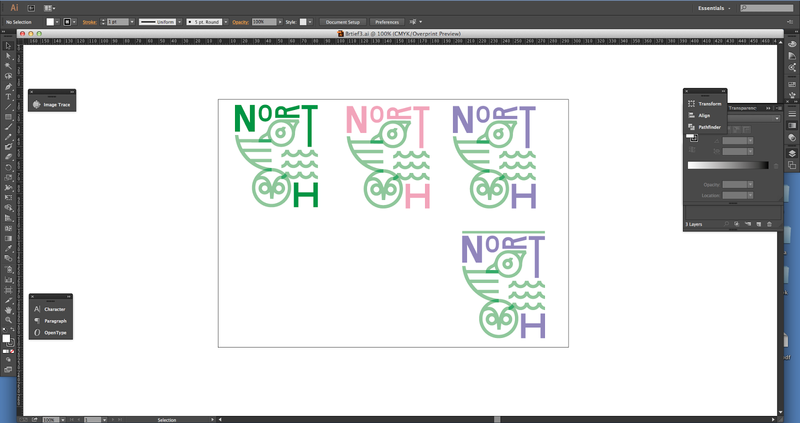 Initially, using the quick icons I created in the initial hour long logo task i decided to use waves to represent Hull. 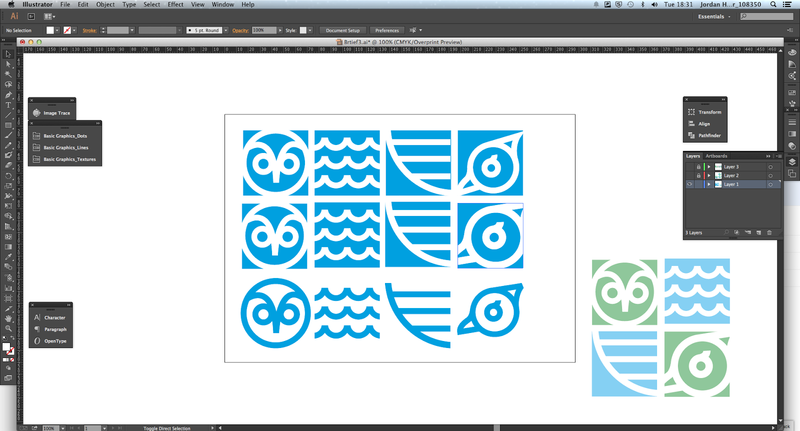 However, I soon realised that waves are not the standardised representation of the city and so later updated the icon. After creating the set of four icons I started developing a range of logo variations. One technique I have tried to develop this year is the rate at which I can produce work, aiming to increase the speed in which I produce variations to increase my productivity and ability to progress through projects. As part of the PPP module I watched a video with renowned logo designer Aaron Draplin, in which he is challenged with creating a logo in 15minutes. Taking inspiration from this video I have started applying the techniques he uses, such as learning and using the various Adobe short cuts and creating variations with small changes. I feel by applying the techniques learned from Aaron's video, I have been able to increace my productivity and ability to produce work in short amounts of time, undoubtedly benefitting my design practice. After a while of playing around with various logo ideas I finally came to a concept I could identify as having a potential application within the project due to its relevance to the brand values outlined at the start of the project. The concept is based upon placing the icons within squares that can be built up and arranged in different ways, visually portraying the brand values of connectivity and growth while simultaneously forming a representation of the four individual cities. After further development I decided to have the 'Capital North' rectangles in a fixed position, meaning that the modular icons would have the ability to be rearranged and built up but the 'Capital North' typography would never move giving the logo a fixed and constant aspect. The image below displays the concept I will display to the group, in which I have tried to replicate the geographical location of each city.